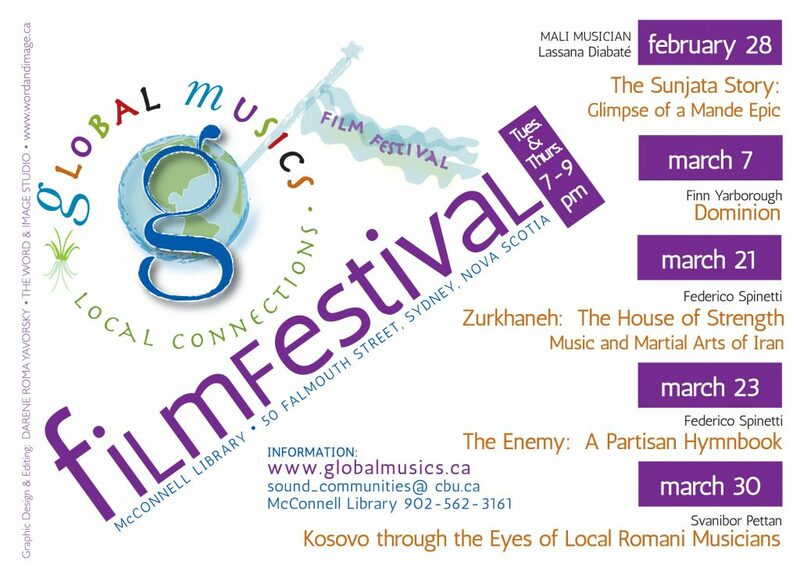 Please join us in attending the Global Musics Local Connections Film Festival. McConnell Library, 50 Falmouth Street, Sydney, Nova Scotia. Tuesday and Thursday 7:00 pm – 9:00 pm. Finn Yarborough– Once attracting a diverse population from around the globe, Cape Breton Regional Municipality struggles to recover from the collapse of the industry that fueled its growth and contributed to one of the worst environmental disasters in North America. The departure of Dominion Steel & Coal Corporation also triggered an economic disaster, fracturing the region’s vibrant social mosaic and tempting many to dream of its return… When dominion over nature becomes oppression of the human body and soul, the key to social and environmental resilience may be turned by the same hand. Professor of ethnomusicology at the University of Cologne, Germany, Federico Spinetti has conducted extensive ethnographic research in post- Soviet Central Asia, Iran, and Italy. 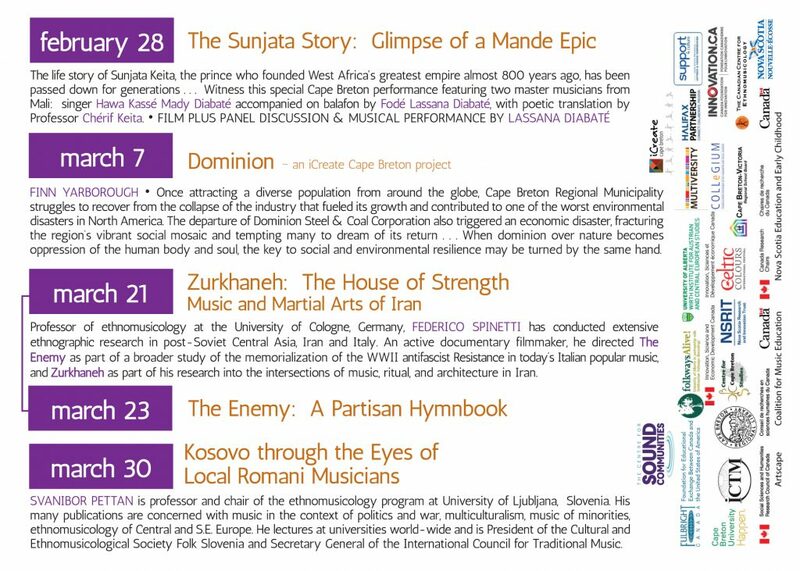 An active documentary filmmaker, he directed The Enemy as part of a broader study of the memorialization of the WWII antifascist Resistance in today’s Italian popular music, and Zurkhaneh as part of his research into the intersections of music, ritual, and architecture in Iran. 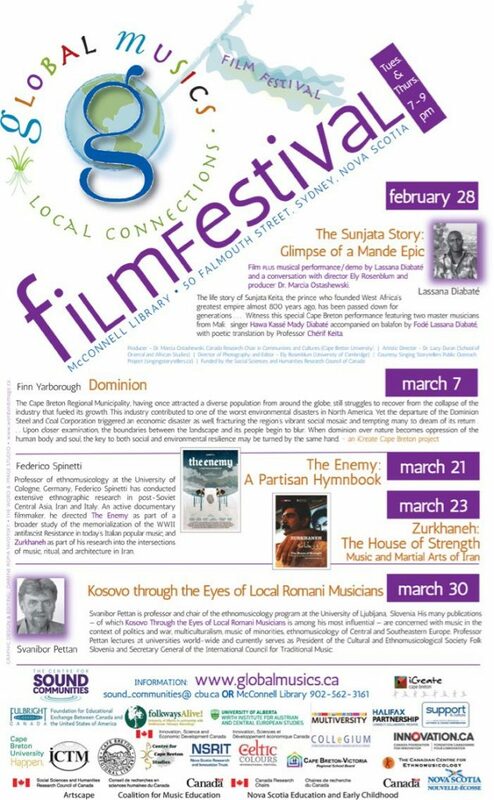 Svanibor Pettan is professor and chair of the ethnomusicology program at University of Ljubljana, Slovenia. His many publications are concerned with music in the context of politics and war, multiculturalism, music of minorities, ethnomusicology of Central and S.E. Europe. He lectures at universities world- wide and is President of the Cultural and Ethnomusicological Society Folk Slovenia and Secretary General of the International Council for Traditional Music. © 2016 THE CENTRE FOR SOUND COMMUNITIES. Website by Beach Pea Design.